It's eerie when your food can watch you eat. Step #1: Line a baking sheet with waxed paper. Step #2: In a small microwave-safe bowl, heat 2 squares of white chocolate in the microwave until they're melted. Step #3: Holding a vanilla wafer rounded side up on a fork, ladle white chocolate over the top. Hold it above the bowl to let the excess drip off. Set the cookie rounded side up on the baking sheet. Repeat with the remaining cookies. Refrigerate until the white chocolate is set. Step #4: Melt the remaining 1 square of white chocolate. Tint it using the blue food coloring and put it into the resealable plastic bag. Using scissors, carefully cut a small piece from one corner of the bottom of the bag. 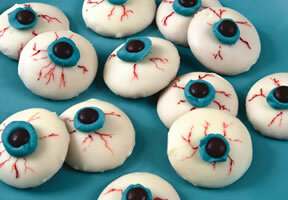 Squeeze a small amount of blue chocolate on the center of each cookie for the iris and place a mini baking bit in the center for the pupil. Refrigerate until set. Step #5: Use a toothpick dipped in red food coloring to draw lines creating bloodshot eyes. Chill until set. If you wink, will they wink back?